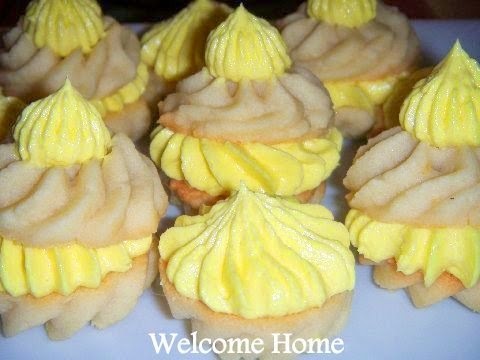 If you love lemon, you'll love these cookies. A sweet little cake-like cookie filled with creamy lemon goodness! Preheat oven to 350°F. In a large bowl, cream together 1 stick butter with sugar. Add egg yolks one at a time, beating between additions. Beat in extract. Beat in flour and salt until fully incorporated. Dough should be the consistency of a soft clay – workable with some stretch, but not runny. Put dough through a large frosting tip into a rosebud. Bake for 8-10 minutes, until tops are just beginning to turn golden brown, then remove from oven and allow to cool completely before frosting. In a medium bowl, beat butter until creamy. Add powdered sugar a half cup at a time, beating to fully incorporate between additions. When frosting is stiff but workable. Add lemon juice and beat until incorporated. Test for flavor, adding more lemon juice if necessary. Add more powdered sugar until frosting hold soft peaks. Pipe frosting onto cookie bottoms and then press another cookie evenly against the center to create a sandwich. Pipe a dot of frosting on top of each cookie. Enjoy!